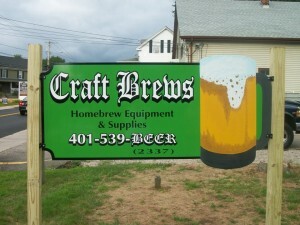 The June meeting will take place on Thursday 6/19 (6-ish) at Craft Brews in Hope Valley, RI. Thanks to Chris T. for hosting us. 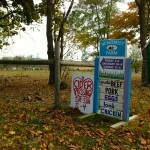 Come on down and hoist one with us! Posted byTom H. June 14, 2014 June 14, 2014 Posted inMeetingsLeave a comment on RIFT Clubhouse Move! 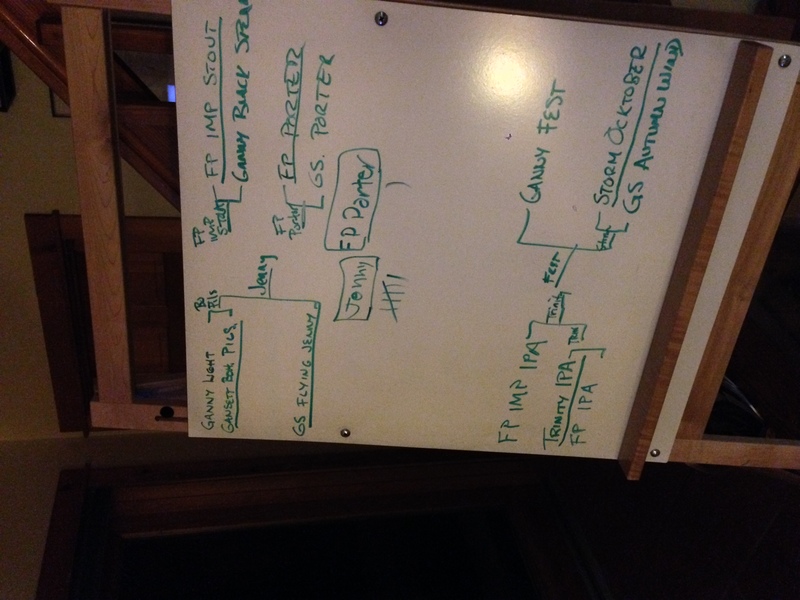 Here’s a picture from last October’s meeting where we pit some Rhode Island beers against each other. To celebrate March Madness, here’s the final bracket. The winner among this set? Grey Sail Flying Jenny! Posted byBil H. March 30, 2014 Posted inMeetingsLeave a comment on March Madness! 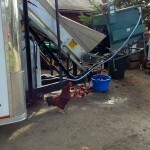 POLL QUESTION: Do you measure the pH of your mash? Posted byBil H. March 30, 2014 March 30, 2014 Posted inSurveysLeave a comment on POLL QUESTION: Do you measure the pH of your mash? 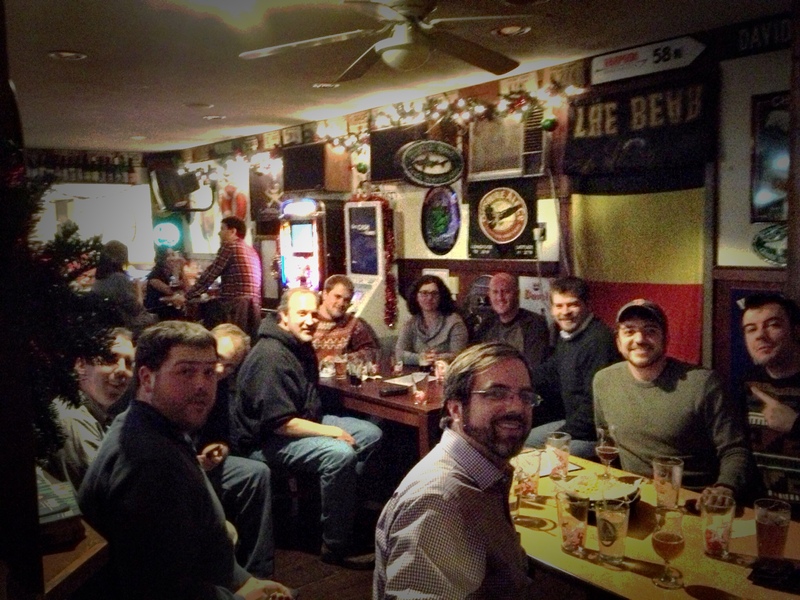 RIFTers bid a farewell to a great 2013 at Track 84. Here’s to new brews in 2014! Posted byBil H. December 25, 2013 Posted inMeetingsLeave a comment on Happy Holidays! One of the perks of RIFT is that you get to see some cool gear that other members have put together. 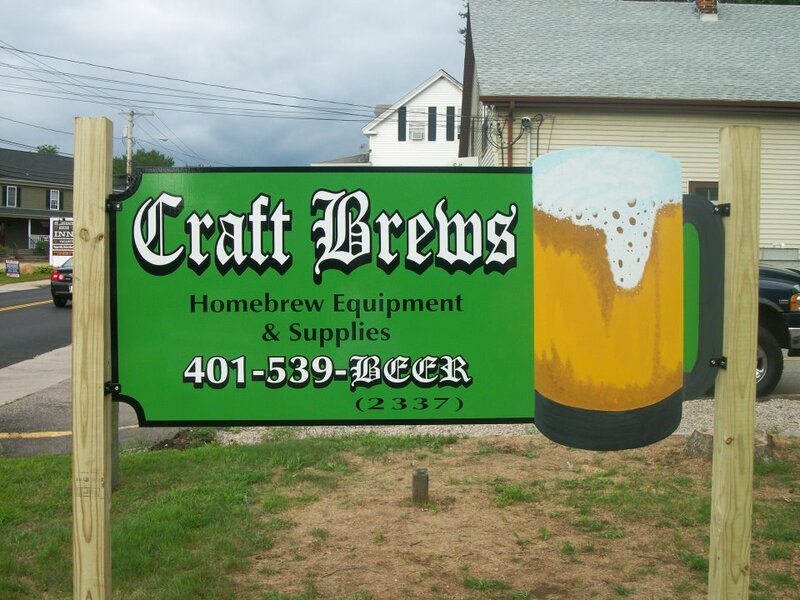 Electric breweries, 70 gallon systems, stuff like that. 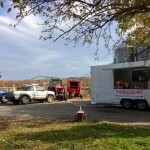 But I’m pretty sure nothing tops Rob’s mobile apple pressing trailer for sheer size and awesomeness in pursuit of fermented beverages. 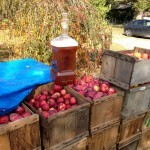 It was great to hang out on a beautiful fall day in Jamestown and get our carboys filled with fresh pressed apple cider. Thanks Rob! 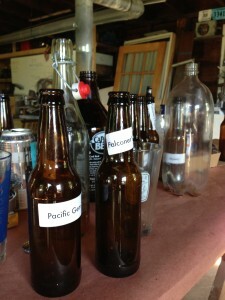 At our May meeting, RIFTers cracked open the results of our single hop pale ale experiment (round 3). 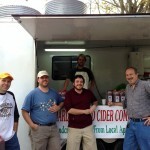 All the beers came out great, with a definite difference among all the varieties. Here are some tasting notes from club members. Big thanks for Mark L. and Matt J. for taking excellent notes, especially as those later samples really started to run together. Vote in the poll below on your favorite variety. 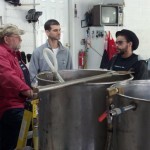 RIFT joined thousands of other homebrewers around the country by celebrating National Homebrew Day with a Big Brew on May 4, 2013. 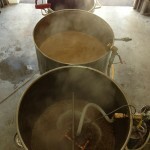 Making full use of John C’s awesome system, we brewed 70 gallons of a dark mild ale, based on the AHA provided recipe. 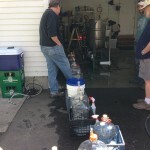 It was a great day to enjoy the spring weather and share homebrews. 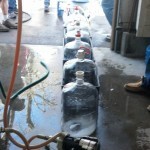 Everyone went home with 5 gallons of 1.052 wort and our next meeting is sure to be filled with milds! 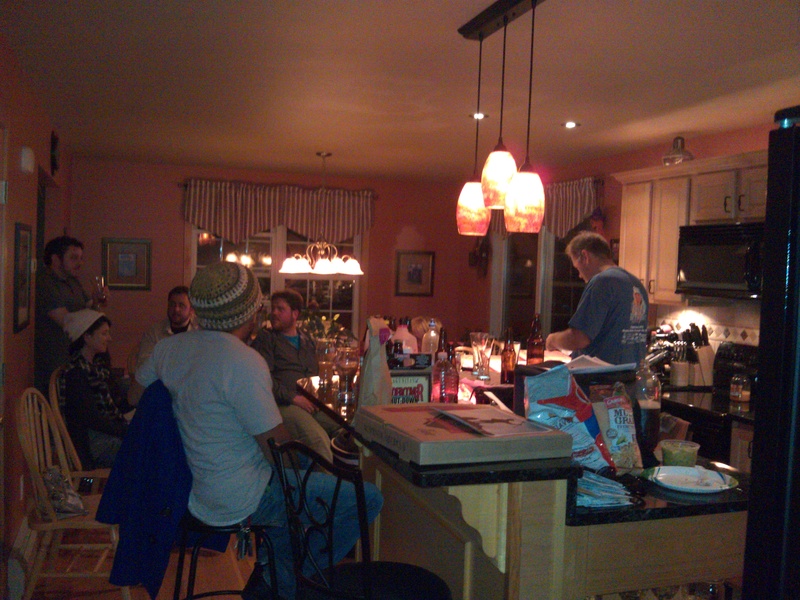 Big thanks to John for hosting and everyone who came out. 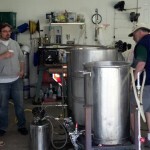 It’s been a while since our last single hop experiment, so it’s time to fix that. Round three of the always tasty, always enlightening RIFT Single Hop Pale Ale extravaganza will get underway this spring, with tastings being done at the May meeting. Anyone who wants to participate will make a simple American pale ale (recipe below), varying only the variety of hop used. This is a great way to really isolate the unique contributions to bitterness, flavor, and aroma that individual hop varieties can add to a beer. At our May meeting we will taste them all side by side and discuss the differences. There’s no restriction on which variety you can choose, but perhaps this would be a good opportunity to try out a new or uncommon hop that you’ve had your eye on? If you’d like to participate, leave a comment on this post with your choice of hop. Mark L hosted and we discussed a number of topics, including the potential participation of RIFT in next year’s AHA Club Night. We’re still waiting to learn what the details of the event are and if other members of the club are interested in helping and participating. Mark L has volunteered to take the lead. 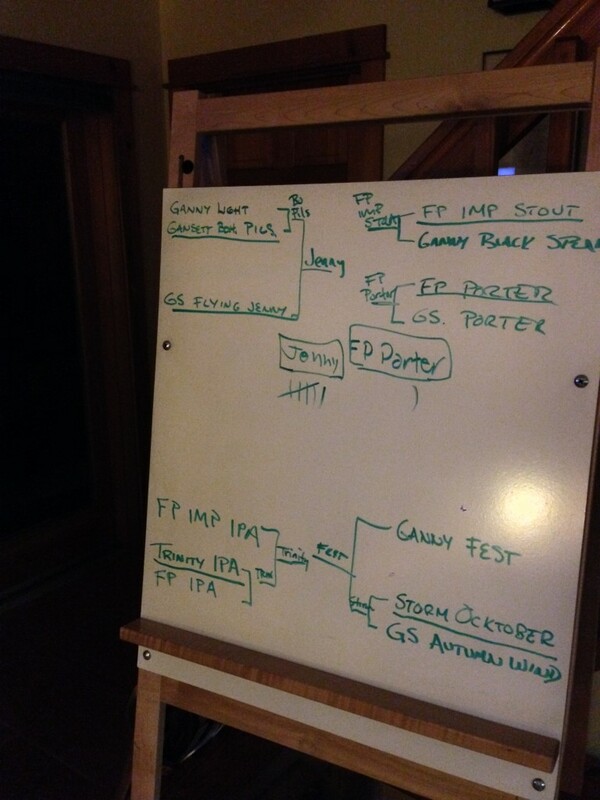 RIFT members raked in a few medals at the recent 2012 South Shore Brewoff. The competition judged 230 entries, which is a good number. Congrats to the following members for their achievements! 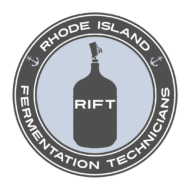 Rhode Island Fermentation Technicians, Proudly powered by WordPress.